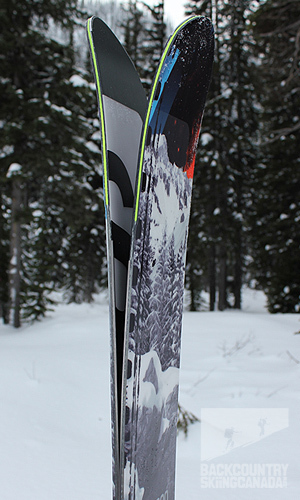 I first skied the Salomon Rocker² 108 Skis at the Red Mountain Gathering event in February 2012 before they were released for retail sale. We were able to ski the Salomon Rocker² 108 Skis mounted with Salomons new Guardian AT Bindings and their Salomon Quest 120 Max AT boots. Almost a year later, thanks to Salomon we have had a pair here at Backcountry Skiing Canada HQ for more than a month now. 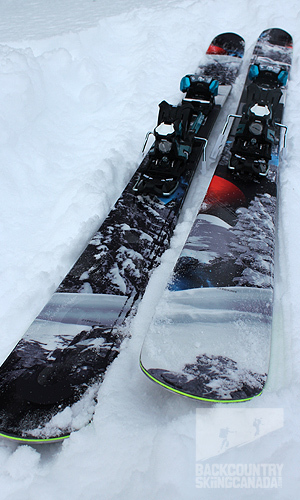 We have spent time skiing pow lines, groomers and crud to get a feel for what the Salomon Rocker² 108 Skis can handle. First, let's take a look at the metamorphosis of the Salomon line and the construction of the 108. Here goes. Under the guise of Mike Douglas the Salomon Rocker² line-up consists of the Salomon Rocker² 122 (from last season) which is the fattest in the line-up as well as the 115, 108 and the skinny-minny 92 and 90 versions. The Salomon Rocker² 122 may have set the stage but Salomon wanted to lighten it up a bit to make it a more versatile ski with better performance inbounds and not just an out of bounds deep powder slayer. To do this they focussed on the tip and tail as this is where the swing weight gives you the biggest impression of overall weight. They lightened both by using a Honeycomb insert at the tip and tail and stopped the metal edge where the early rise begins. Since the ski isn't on the snow at these points, no edge is required and is rounded off instead, which prevents hooking and edge catching. The metal edges are thicker for increased durability and improved shock resistance, and the tail is somewhat more flat for additional versatility. To eliminate the tip chatter with all this rocker going on, Salomon used an ABS reinforcement frame (the yellow bits at the tip and tail) and designed the ski with pure curves so there is no weak point where chatter can initiate. 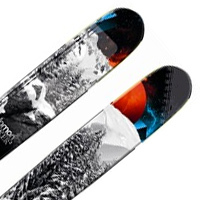 If you want to read up on Salomons new skis for 2013 then click on over to the reviews of the Salomon Q-105 and Salomon Q-98 skis. There is a nice generous sidecut underfoot and the Salomon Rocker² 108's wide points have been moved closer to the centre of the ski for better carve potential on the groomers. You can easily see this on the tail where the width has an obvious early taper for catch-free surfyness. 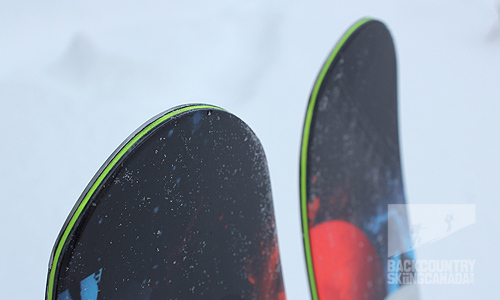 The Twin Rocker shape provides rocker in the tip and tail for excellent floatation in the pow, however some camber under foot still allows you to carve up the groomers when the powder has been all eaten up. Plenty of rocker on the tip and the tail. Edgy Monocoque: Designed for free skiing applications, with reduced excess material for more efficient energy transfer from skier to snow. Full Wood core: Wood from tip to tail improves stability and rebound, maximizes ski to snow contact, and filters vibrations. Honey Comb Tip & Tail: Light honeycomb construction in the tip and tail extremities reduces inertia to make the ski more maneuverable and playful. Reinforced with an ABS frame for durability. 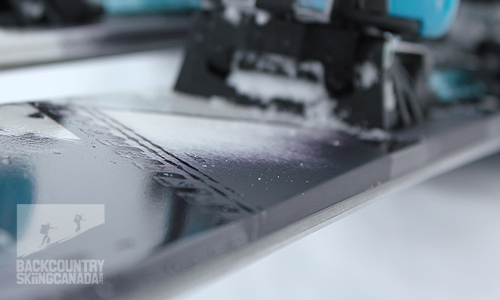 Edge Free Extremities: No edges in the tip or tail area of the ski provides more fluid gliding in powder because edges don't "hang up", and weight is reduced. Edges: Thicker edges increase durability and improve shock resistance. Total Edge Reinforcement incorporates fibre reinforcement directly on the edges, providing edge stiffness for improved durability and grip. 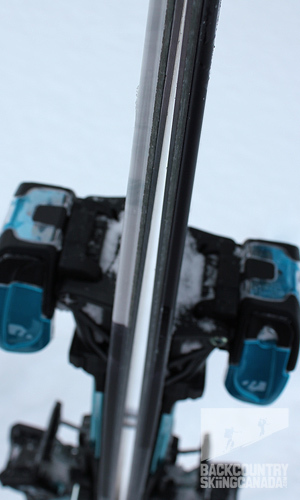 ABS: ABS reinforcement frame at the tip and tail help dampen the ski chatter. With dimensions of 132mm in the tip, 108mm underfoot, and 125mm at the tail, this is a fat ski that can actually still carve. 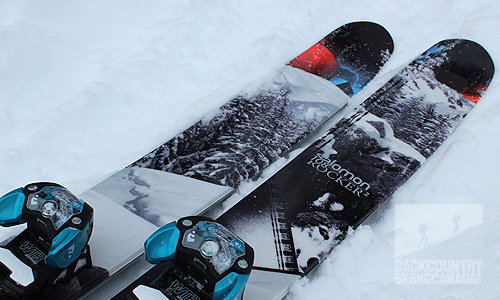 Powder is not a problem for the Salomon Rocker² 108 skis thanks to the full rocker tip to tail. In the backcountry the ski feels incredibly stable, floats you in the pow, and on wind blown hard pack it drives through like a semi. The additional weight of this ski is a blessing on the down as it is torsionally stiff and holds an edge with minimal effort. On the up however I was not looking forward to the additional gram-age as this is not the lightest ski out there, but surprisingly it was relatively miniscule. The ski's girth makes you want to ski like a 20 year old with baggy pants, ready to take on anything (not bad for a 43 year old). The solid, stable platform drives through snow and likes to run fast with wide. 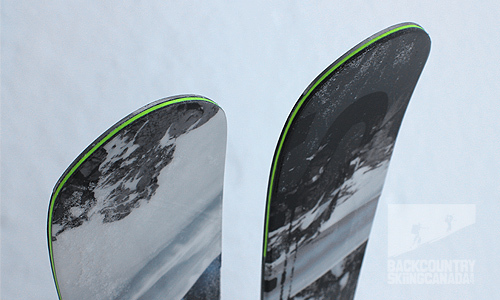 These are not your fathers powder 8 skis. Open them up and be surprised at how easy they are to carve in most snow conditions without fearing the tips will submarine. In bounds on the groomers I was surprised by how well they carved given the width. 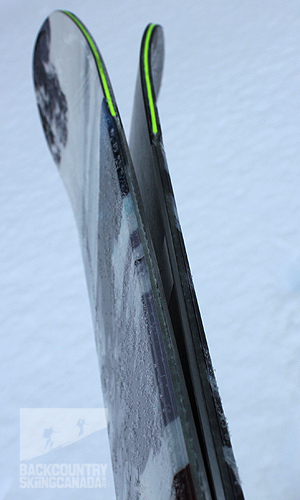 It did take some effort to get the Salomon Rocker² 108 Skis on edge but once there, they sure held it well. I found turn initiation was easy but the finish was not as complete as it could be. The skis were lively and responsive; in the powder you could let these suckers run and be assured of stability and edge grip. Short radius turns are obviously not their forte and being relatively stiff, moguls were not an ideal environment for them either. I did experience minor tip chatter on hard pack but much less than comparable skis with full rocker - the ABS reinforcement frame was doing its thing. Overall, I found the Salomon Rocker² 108 to be a fun everyday powder ski, but on the heavier side for a dedicated touring ski. They were stable and able to carve in bounds. Fat, but not too fat and a little cambre to ensure they still carve in bounds. 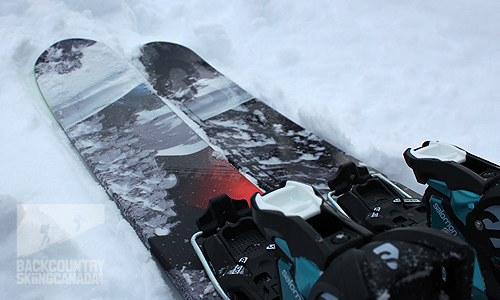 A solid ski that instils big mountain confidence to open up and rip it. Great float in powder thanks to the early rise and fun to carve at the resort. Not the lightest ski out there for the dedicated backcountry skier. Top sheet graphics are not my thing but that is a small personal opinion. No a quiver killer but great for in-bounds and out-of-bounds Pow.